Since Donald Trump's shocking victory in the November 2016 presidency, he has presided not only over one the most turbulent political times in recent memory, but also the best economy the country has seen since well before the financial crisis. The stock market recently hit all time highs but interest rates have spiked unleashing a surge of volatility across risk assets, inflation is higher but so are wages, consumer and small business confidence is near record highs, but so are both the national debt and budget deficit. 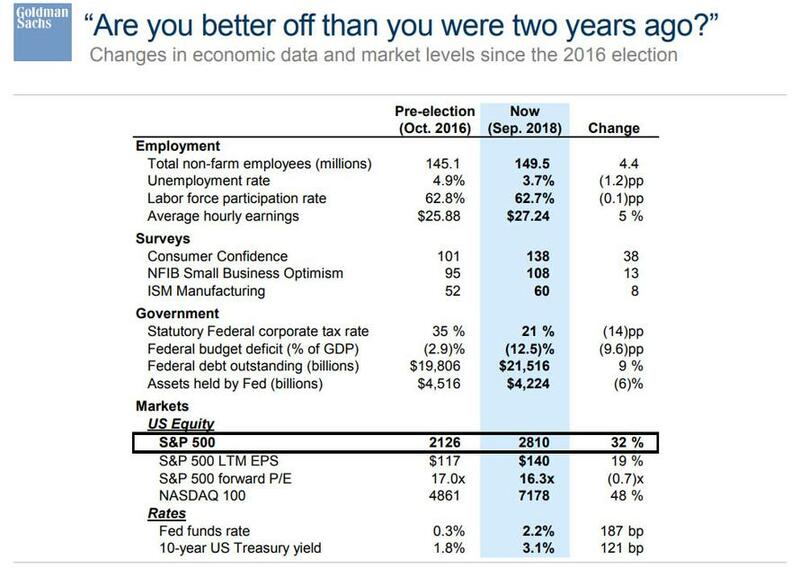 The following chart from Goldman's David Kostin shows how much things have changed since the days just prior to the November 2016 election through September 2018. And while the chart does not include US GDP, which recently printed at 4.2% for the third quarter, compared to the 1.6% gain in 2016, it presents a good enough snapshot of the change in the fiscal-stimulus-supercharged-economy over the past two years.